Once mold is discovered, take steps to remediate it in your home or building. Mold spores are a natural part of our indoor and outdoor environment. However, when it begins to grow, the mold may damage building materials and furnishings, as well as trigger health issues. Not all mold is toxic; however, many molds can contribute to poor health and must be abated in the same way. To be clear, it's impossible to irradicate any mold completely since it's part of a natural environment. Mold remediation is not a process that completely eliminates mold, but instead is a process of cleaning and restoring your home to normal conditions that keep mold under control. Mold requires three elements to grow: moisture, moderate temperatures, and a food source. Mold spores grow best when relative humidity exceeds 65 percent and the air temperature is above 75 degrees Fahrenheit. It feeds on cellulose-based materials such as wood and paper products, as well as cloth, such as cotton and linen. Mold also feeds on protein-based materials, such as leather and hair. Identify all areas where mold is growing. Look under and behind furnishings and items stored on countertops, shelves or in cupboards. You might need to remove parts of building material to complete the inspection; look under flooring, sink cabinets, wallpaper, drywall, or baseboard. The appearance of mold varies. Colors include white, gray, black, green, brown, as well as others. The texture can be velvety, cottony, leathery, or granular. Damaged areas might appear stained or discolored. If you smell a musty odor, but can't see mold, assume it's there. For example, mold can grow hidden inside a building's ventilation system. Locate the moisture source. Depending on the location of the mold, check for plumbing leaks, roof leaks, ice dams, wet basements, yard run-off/flooding, condensation, and high humidity. Any moisture that is present will foster the growth of mold. Health concerns: Hire a professional if you're unable to do the job due to a health risk. People at risk include children and elderly individuals, individuals with respiratory conditions such as asthma or allergies, and individuals who may have a weakened immune system from chemotherapy, organ transplant, or HIV/AIDS. Unknown source of mold/moisture: A professional can locate mold if there's a musty odor without visible signs. Professionals are also trained to discover sources of the moisture fostering mold. Extensive damage: If the area is less than ten square feet, you can usually complete the job yourself. Otherwise, you'll likely need a team of professionals who can quickly address the problem. Hazardous materials: A house built before 1980 might have floor and ceiling tiles containing asbestos, as well as lead paint. These building materials are known health hazards, and a certified contractor is trained to safely remove them. Structural damage: Extensive water damage can cause problems that need to be addressed by a building contractor or structural engineer. Approach this like any other major home project. Obtain quotes that outline the scope and cost of the work. Ask about past experience, training, and certifications. These people will work in your home, so hire someone you trust and can freely discuss questions and concerns. Repair leaking plumbing, roofing, foundations, sump pumps, or other sources of unwanted moisture. If rainwater is entering a home, clean or install gutters to divert water. Make sure the landscape elevation slopes away from the house. Install and use a sump pump if you have ongoing basement moisture issues. Reduce condensation in high-humidity rooms, such as a basement, bathrooms, and the kitchen. Run exhaust fans that are ducted to the exterior of the home. Run a bathroom fan for at least 30 minutes after showering or bathing. Keep humidity in the home between 20 and 30 percent during the winter. Run a dehumidifier (and air conditioner) during the rest of the year to keep humidity between 30 and 60 percent. 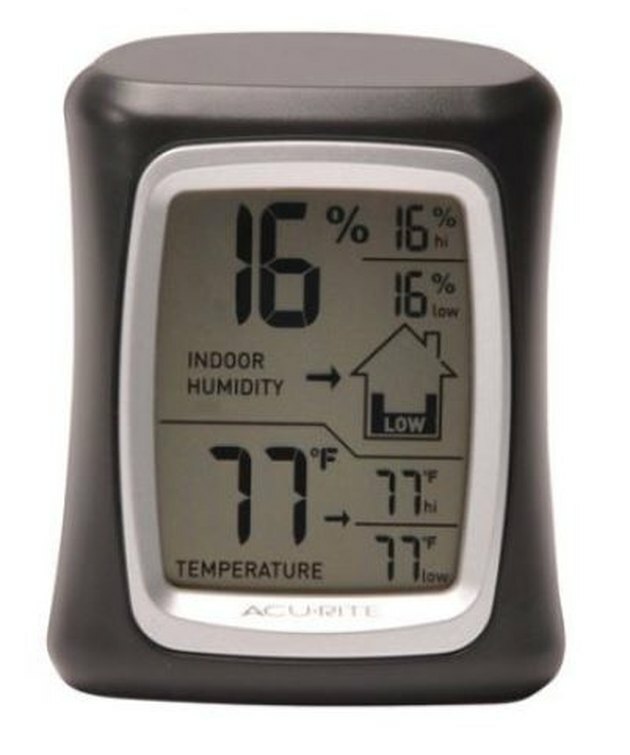 Purchase an inexpensive humidity and temperature monitor for your home. Old clothes (long sleeves and pants) and shoes that can be laundered or thrown away after cleanup. Put on the protective gear and old clothing. Then remove porous material damaged by moisture and mold: drywall, paper, insulation, carpet, carpet pad, and ceiling tiles. 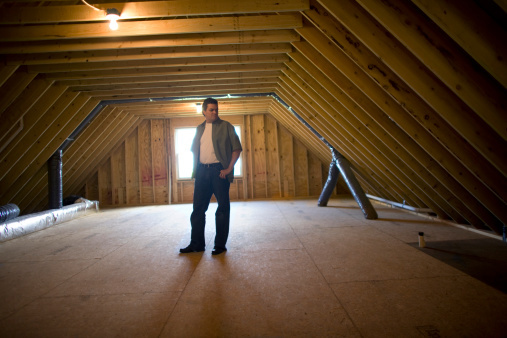 If solid wood is structurally sound, don't remove it. Bag debris or wrap it in plastic sheeting and seal it with duct tape before carrying it out of the house for disposal. Protect yourself and your home from mold spores. Vacuum remaining dust and small pieces of debris; you can rent a wet and dry vac with a HEPA filter. Once the job is done, replace the filter and wash out the tank, hose, and attachments with a bleach and water solution. Open windows and interior doors to improve ventilation. Prepare to wash non-porous surfaces, such as hard plastic, solid wood, concrete, metal, or glass. While wearing the protective gear and clothes, apply a household detergent and scrub with a soft brush until signs of mold disappear. Wipe up the cleaning solution, rinse with water, and wipe dry. Although it is commonly used, bleach is really not necessary unless the mold damage was caused by sewage. Scrubbing with detergent and water effectively removes mold and is safer for your lungs. If it's necessary to use bleach, combine 1/2 cup bleach with 1 gallon of water. Apply with a sponge or rag and wipe dry. Do not rinse. Allow the area to dry completely. Cleanup is done when you cannot see signs of moisture damage or smell mold. Once cleanup is complete, wash or dispose the old clothing in a plastic garbage bag and shower. Monitor indoor humidity and keep it between 30 and 60 percent. Watch for signs of moisture problems or mold growth returning. If mold returns, fix the moisture problem and repeat the cleaning steps. If you have health problems that return or get worse, such as asthma or allergy symptoms, you may need professional assistance to eliminate remaining mold.